For the past five years, the Steiner Chorale, which has embraced the power of excellent music since its formation in 1968, has provided an opportunity to aspiring young people by sponsoring an annual Vocal Scholarship Competition. This event draws high school-aged students from music programs from all school districts across the state of Michigan and both recognizes and financially rewards the most talented among them. 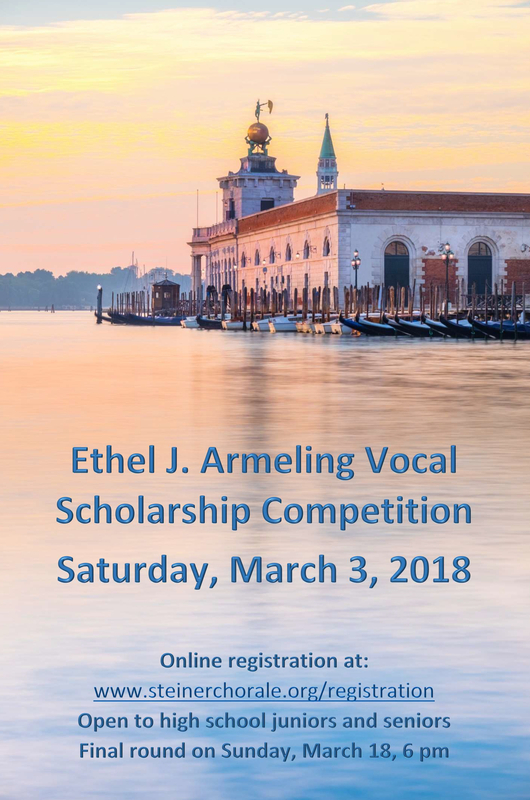 As of the 2014 season, our Vocal Scholarship Competition has been renamed the Ethel J. Armeling Vocal Scholarship Competition, in honor of this most distinguished voice teacher (Professor Emeritus, MSU), who has been such an inspiration to students of vocal music for so many years. The Steiner Chorale greatly relies on donations we receive from individuals, businesses and organizations like yours to make this a truly successful and lasting annual event.